The Cleveland Browns have an impressive tradition, with the team being found it almost 70 years ago, so it is a bit surprising that they are yet to win a Super Bowl. So far, their efforts of making a deep run in the playoffs fell flat, but the team is playing better each season and this year they are likely to win the division. The interest for Cleveland Browns posters is obviously on the rise and ChefDecor.com is more than happy to provide top quality artwork for those who seek it. 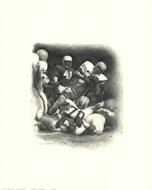 There are no Cleveland Browns art prints featuring a helmet logo at ChefDecor.com, for the simple reason that they are the only football team without one. This is what makes them stand out from the crowd, so even in the absence of a logo, Cleveland Browns posters with the undecorated helmet are a great choice. While the headless itself might be a big plane and unassuming, there is nothing mundane about the stadium they are playing on or the enthusiastic crowds.